Optimised formulation for countering excess oestrogen production. Contains natural extracts studied for their ability to stop conversion of testosterone to oestrogen in men. Helps combat overproduction of oestrogen in women. Aromatisation is a complex hormonal process that affects both men and women at certain times of life, particularly after the age of 50. • In men, the conversion of testosterone into unwanted oestrogens may exacerbate benign prostatic hyperplasia (BPH), also known as enlarged prostate, and increase the risk of it developing into prostate cancer. An older man actually has as many oestrogens as a woman – the cause of the unwelcome partial feminisation he may suffer. Erectile dysfunction is also more common. Supplementing with testosterone or its precursors becomes less effective and it is the enzyme aromatase which is the main culprit. • Chrysine, is a flavonoid compound extracted from blue passionflower (Passiflora caerulea). This powerful flavonoid inhibits the conversion of testosterone into oestrogen, with no unwelcome side effects. • Standardised extract ofAgaricus bisporus prevents and reduces testosterone-induced cell proliferation and increases apoptosis in breast cancer. • Naringin, extracted from grapefruit, is a recognised oestrogen inhibitor. • Genistein extracted from Sophora japonica, is a more active flavonoid than that extracted from soya. It is a potent inhibitor of aromatisation processes. • Quercetin is a natural flavonol recognised for its anti-inflammatory effects on the prostate. • Epilobium parviflorum (Small-flowered Willowherb) is a plant rich in terpenes, phytosterols, flavonoids, tannins and especially oenothein B, which together inhibit aromatase and 5-alpha-reductase. • DIM or diindolylmethane is a substance extracted from the cruciferous family (broccoli, cabbage …) It balances and supports optimal function of endocrine and hormone systems, both in men and women. In older or middle-aged men, it is important to reduce conversion of testosterone into oestrogens that accumulate in the prostate. DIM has been shown to curb the metabolism of testosterone and in particular its conversion into oestrogens, thus supporting healthy prostate function. In women it helps maintain testosterone in its free form, which promotes hormonal and emotional equilibrium. In addition, DIM has been identified as a natural indole, able to boost the body’s natural defences against environmental carcinogens. • Zinc picolinate is a form of zinc that plays a significant role in hormonal homeostasis. Interacting with the majority of hormones, particularly pituitary hormones, it inhibits prolactin which is known to stimulate harmful production of dihydrotestosterone (DHT). 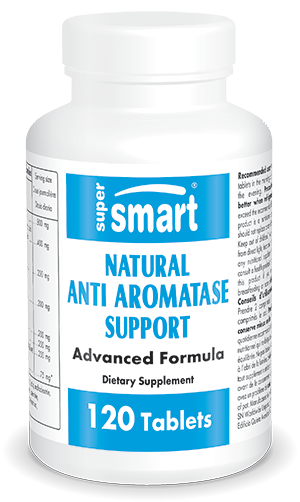 The new formulation of Natural Anti Aromatase Support offers a natural, multi-faceted solution to the problem of aromatisation, and – based on natural plant ingredients - is very well tolerated. Other ingredients : calcium carbonate, stearic acid, microcrystalline cellulose, magnesium stearate, silicon dioxide.